Dwight Howard, traded to the Brooklyn Nets this off-season is now reportedly heading to the Washington Wizards in a one year deal worth $5.3 million. 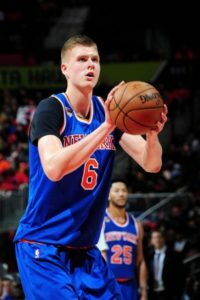 Even though Howard is known around the League to have attitude issues and can be disruptive in the locker room, the Wizards needed a Center. 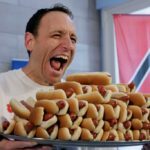 In the Annual Independence Day hot dog eating contest at Coney Island, defending champion Joey Chestnut took home the title again, and this time broke his own record of 74 hot dogs in 10 minutes. Chestnut has won the title 11 times and is ranked #1 in the world by Major League Eating (yes, that’s a thing). Miki Suto won her 5th consecutive title in the women’s event by downing 37 dogs. Los Angeles Dodger Matt Kemp collided at home plate in the third inning with Texas Ranger Robinson Chirinos causing both players to be ejected. Kemp was tagged out, but not before lowering his shoulder and running into Chirinos. Chirinos shoved him causing both benches to clear. According to Chirinos, “he leaned into me and put his shoulder into me. 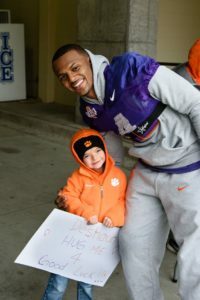 That’s when I rushed him. Everyone knows the rule, they preach it to us in spring training. It was emotional.” Dodgers won the game 3-2. LeBron James wowed the crowd on Thursday night posting his 59th career triple-double against the Los Angeles Lakers. The Lakers also had a solid night with 13 points, 11 assists and 8 rebounds from Lonzo Ball and a helpful 26 points from Brandon Ingram. Unfortunately for the LA, that wasn’t enough to fend off the might Cleveland Cavaliers. The most talked about part of the game was after the buzzer when LeBron searched out Lonzo for a quick chat. 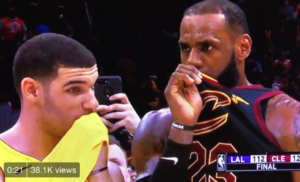 LeBron pulled up his jersey so no one could understand what he was saying to the famous Ball brother, and both players refused to reveal the conversation in post-game interviews. Lonzo grew up idolizing LeBron, and LeBron seems to have taken a liking to the rookie. To add intrigue, LeBron will be a free agent this summer and there’s talk of where he takes his talents next. Maybe to LA? Speaking of injuries, the Indianapolis Colts announced their quarterback Andrew Luck will not play at all this season. Luck has been suffering from a shoulder injury since 2015 and has now been officially placed on injured reserve. 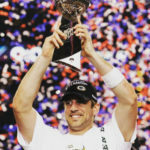 Luck has the bigggest contract in Colts history, so it’s no surprise they were hesitant to take him out for the season. As the oldest Wimbledon finalist since Martina Navratilova in 1994, Venus Williams fell in the Championship match to Garbine Muguruza. Ranked #15, Muguruza beat Venus 7-5, 6-0. In the men’s final, Roger Federer continued his dominance by winning his 8th Wimbledon final. At 35 years old, Federer keeps adding to the record books. Unfortunately for fans, his Wimbledon final was uneventful against Marin Cilic with a 6-3, 6-1, 6-4 victory. Cilic claimed to have a blister, and at one point Cilic broke down in tears knowing he couldn’t play his best against the best. He now has 19 Grand Slam titles under his belt and will try for his 20th in New York during the US Open which begins August 28th. 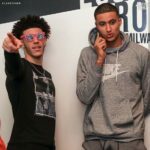 The LA Lakers Lonzo Ball has been turning in solid performances during the NBA Summer League, but now has the team and his fans concerned as he walked off the court in the 3rd quarter of the Laker’s semi-final match against the Dallas Mavericks. The injury appears to be “tight calves”, but the Lakers certainly don’t want an injury to the most hyped player of recent memory. 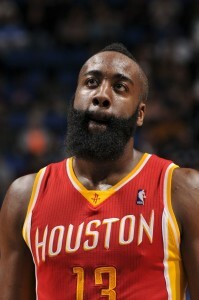 The Houston Rockets signed James Harden to the largest contract in NBA history. After Harden made the NBA All-Star Team, he was eligible for a designated player extension which combined with his $118 million extension signed last July, boosts him to a $228 million contract until the end of his contract in 2022. The Los Angeles Lakers Lonzo Ball (#2 pick in the draft) had a rough start to his NBA Summer League debut going only 2 of 15 shooting against the Los Angeles Clippers. He came back strong, however, the next night with his first triple double in the pros. Not surprisingly, Ball is bringing the fans out with over 17,000 tickets sold for Saturday night’s game. He’s even wearing his Big Baller Brand shoes. 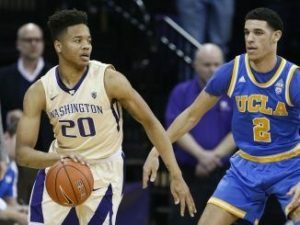 In other summer league news, the Philadelphia 76ers #1 pick Markelle Fultz suffered a sprained ankle Saturday night in a matchup with the Golden State Warriors. He will miss the rest of Summer League, but is expected to be back to normal activities in 1-2 weeks.